The Tong Peal hydraulic box tipper is considered by many to be number one for emptying boxes correctly and speedily. High capacity box tipping and gentle flow of copr means up to 30 tons per hour can be achieved. The crucial factor to this is the speed and forlift driver can charge and discharge the system. Twin hydraulic rams tip the box through 150 degrees powered by a high capacity electric/hydraulic pump. 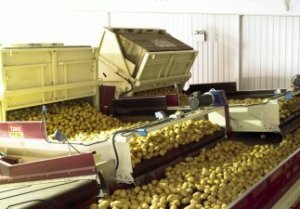 A fully automatic operation is by micro processor and crop sensors which control the tipping of the box and the flow of crop onto the next section of the handling line. Manual controls are fitting so the machine can be controlled from push buttons in the control panel door is desired. The standard machine has a high specificaion and options incllude hydraulic clamp lid and a choice of 'flow doors'. For operator security and health and safety regulations a foolproof light guard protection system is always fitted when the box is below 1800mm high. Forward in-line conveyors are mainly fitted to make a reservior of crop when recharging with another full box. The conveyors also give the best of feeds onto the next part of the handling line. Depending on space a capacity the customer has the choice of a single or a twin box tippign system. Give us a call to discuss you requirements and find the right machine for the situation.